The president’s decision to nominate Baucus signals his interest in focusing on economic ties with China. 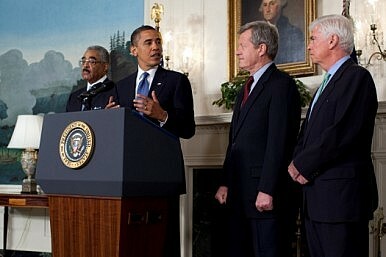 President Barack Obama will nominate Senator Max Baucus (D-MT) as the next ambassador to China the Washington Post and other publications reported late Wednesday local time. The move signals that the Obama administration will seek to focus on America’s economic relationship with China as the latter attempts to rebalance its economy to give greater weight to domestic consumption. Baucus is the powerful chairman of the Senate Finance Committee. He is currently serving in his sixth term as a senator from Montana but announced earlier this year that he would not seek reelection in 2014. The 71-year-old lawmaker would’ve faced a tough reelection campaign and was increasingly at odds with his Democratic caucus on crucial pieces of legislation like gun control, which he opposed. Throughout his 35 year tenure as a senator, Baucus has been a cautious supporter of bringing China into the global economy, and expanding America’s bilateral economic relationship with Beijing. For instance, Baucus expressed significant reservations about the Clinton administration’s initiative to bring China into the World Trade Organization in the late 1990s. In 1997, Baucus told the Clinton administration to take a “realistic view” and said “My concern is that the Administration will be a bit too naive, a bit too Pollyannaish on China, that it will let China accede to the WTO and hope it will all work out.” In the wake of the global financial crisis a decade later, many members of Obama administration felt that the Clinton administration hadn’t gotten enough assurances from China before supporting its WTO candidacy. Still, he has continued to be a constant critic at what he views as China’s unfair trading policies. One way Baucus felt China could take action to reduce the trade imbalance was by floating its currency. He has also supported the U.S. taking action to try to force China’s hand on the issue. When the Treasury Department failed to label China a currency manipulator during the latter half of the George W. Bush administration, Baucus co-sponsored legislation that would have forced the Treasury Department in consultation with the Federal Reserve to take actions to cancel out the perceived trade advantages China gained from artificially suppressing the value of its currency. Baucus has also attempted to balance America’s economic interests with its desire to improve human rights in China. During the George H.W. Bush administration in the early 1990s, the president had to personally reassure Baucus that China was not exporting goods produced by prisoners in labor camps. If confirmed, Baucus will replace outgoing U.S. Ambassador Gary Locke as the top U.S. diplomat stationed in China. Locke announced his resignation this fall and is expected to leave the country any day now. Although the U.S. will be without a permanent ambassador to China for some interim period, Baucus is likely to enjoy a smooth and relatively quick confirmation process. His longstanding career in the Senate and penchant for sometimes reaching across the aisle virtually guarantee he will have enough supporters in that body to be confirmed. In addition, last month the Democrat controlled Senate changed the body’s rules to prohibit the use of filibusters to slow the confirmation of any presidential nominee besides prospective Supreme Court justices. Max Baucus is the latest in a string of trade-oriented U.S. Ambassadors to China.